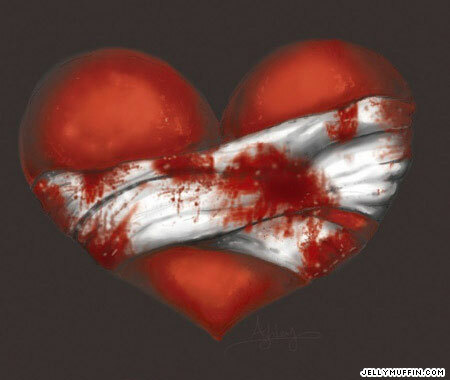 Coolred's Rant: How can you mend a broken heart...? Last night I had one of the worst headaches Ive ever experienced. I ended up taking quite a bit of pain reliever before it would even touch the pain...but eventually the medication worked and the pain eased up...and all was well again. That particular pain was quickly forgotten once it was gone...I was strolling the new City Center Mall within hours....how easy we forget.....sigh! Another pain that is easy to forget once the moment has passed is the pain of childbirth. Ive had 5 children...during one of those births I nearly died...as well as my son....but I went on to have 3 more children after him...why...because as soon as you hold your child in your arms...its the best form of pain relief there is. Nothing compares....and the pain fades into the back ground. However...the real pain of childbirth comes after...when you take that baby home and start the lifelong process of raising, nurturing, worrying, hoping, praying, failing, and feeling guilty for just about every mistake made (real or imagined) all the while riding just about every other emotional rollercoaster that can be endured. One of the scariest rides your ever likely to live through...and most of the time you feel like your riding it alone. I realize that fathers love their children (pardon me if I say "some" fathers...personal experience talking)...but the mothers love is something else all together. If your a mother you know what I mean. That child is a part of your body...he shared your blood...slept to the tune of your heartbeat....had a vote on whether that last meal was acceptable to all concerned. In order to enter this world he had to tear and forever destroy whatever youthful figure you once had...but you dont complain...you grit your teeth and push out your greatest joy...and your most painful heartache....a heartache that last from the moment you realize your pregnant...until you draw your last breath...a pain that no amount of pain reliever can touch. After watching them grow and develop...from rolling to crawling to walking then running...every moment that passes in your childs life is a moment that brings you closer to when they will eventually use that momentum to leave you (or you them depending on the situation)....but eventually...the heart breaks...never to be mended completely because your child comes to the erroneous conclusion that he doesnt need you anymore....that he "is a man" and can probably do just as well without you. until you have a child of your own...then you will understand...then maybe you can advise me on how to mend this broken heart...cause I havent got a clue. I feel your pain, sister. May you find the strength to go through this ordeal. After they advise you maybe you can clue me in. What beautiful words and even greater thought. I love every word you wrote here. The thing about mothers love and the pain it causes...its a gift that keeps on giving...sigh. I think about you so much. The only thing I can offer is my friendship and the biggest cyber-hug ever. I fell behind in reading your blog, so please excuse the lateness of this response. With five children, I'm sure this post will remain alive for a long time. This is so beautifully written. You've touched something very primal and personal, yet nearly universal. I'll never forget the night my daughters left us on the same day. We put them on a plane for Egypt, at their insistence, and I cried my eyes out in a dark and lonely room. My girls aren't even my birth children, so I can only imagine and stand in awe of the full ride you describe. just the first paragraph here touched my heart... i had to stop reading coz my eyes filled w/ tears... for i have felt so many things you talk about, especially the guilt of doing things wrong and feeling like i'm riding the rollercoaster alone. so... in a bit, i'll come back and start reading again. A new discovery has been found to repair tissue damage caused by cardiac arrests. The scientists have experimented NRG1 on rats and it enhanced the general functioning of the heart. Though it is still unclear as to whether NRG1 is directly responsible for the cell renewal process, but the study has revealed that it can augment the regeneration process. Heart Damage...uhm...thanks. Nice to know. Actually more relevent research in my opinion is that showing that an emotional broken heart, does cause physical cardiac damage but it can be repaired. Robert Munsch's "I'll Love You Forever" ostensibly a beautifully illustrated children's book, is must reading for all adults, especially parents, or aunts, uncles, grandparents, and maybe even adoleschents going through their separation and individuation phase (it has to happen but is done sometimes more graciously than others). The book is an obligatory gift to all pregnant women. And yes, in a country that has language police (Canada/Quebec), this could be enforced!